Today's VETgirl online veterinary CE guest blogger is Siobhan Haney, VMD, MS, DACVR (RO), MBA, a radiation oncologist at Hope Veterinary Specialists and Veterinary Cyberknife Cancer Center. Here, she explains what you need to know about updates in radiation therapy and Cyberknife! Radiation therapy is used in veterinary medicine to treat a variety of localized tumors. It is often used in conjunction with other treatment modalities, such as chemotherapy, immunotherapy or surgery depending on the expected biologic behavior of a tumor. Recent trends in radiation therapy are towards more “tailored” therapy, meaning that more normal tissue is being excluded from the radiation field and the dose of radiation is much higher within the tumor. This article will review the basics of radiation and new advances in the field. Principles and Basics of Radiation: The principle mechanism by which radiation works is by damaging the DNA of neoplastic cells. Photons or electrons are generated with a linear accelerator, which then are targeted to a patient’s tumor. The effects of radiation are dependent on the presence of oxygen within a cell. Tumors will respond to radiation therapy depending on their rate of cellular division, i.e. slowly dividing tumor cells will respond slowly to radiation whereas rapidly growing or dividing tumor cells will respond in a more rapid fashion. Examples of slow-responding tumors are low grade soft tissue sarcomas or acanthomatous epulides. Rapid-responding tumors are oral malignant melanomas or squamous cell carcinomas. Radiation Protocols are typically divided into 2 categories: curative-intent, or definitive radiation, or palliative-intent, or hypofractionated radiation. Definitive radiation is utilized for patients that have a good overall prognosis and may consist of daily small treatments of radiation that build up to a high cumulative, or tumoricidal dose of radiation. With conventional radiation therapy units, definitive protocols usually consist of 16-20 treatments that are given over a 4-week period. Palliative-intent, or hypofractionated radiation therapy consists of larger doses of radiation that are usually administered 1-2 times per week over a 4 to 6 week period. This type of protocol is intended for patients that have a guarded to poor prognosis, for tumors that are too large to remove surgically, or because of owner goals. Palliative radiation therapy is also excellent for pain control, i.e. for patients with bone tumors. Intensity Modulated Radiation Therapy: Intensity modulated radiation therapy (IMRT) is a new technology in radiation oncology that delivers radiation more precisely to the tumor while relatively sparing the surrounding normal tissues. IMRT has wide application in most aspects of radiation oncology because of its ability to create multiple targets and multiple avoidance structures, to treat different targets simultaneously to different doses as well as to weight targets and avoidance structures according to their importance. By delivering radiation with greater precision, IMRT has been shown to minimize acute treatment-related morbidity, making dose escalation feasible, which may ultimately improve local tumor control. IMRT utilizes multileaf collimators, which are made up of individual "leaves" of a high atomic numbered material, usually tungsten, that can move independently in and out of the path of radiation in order to block portions of the beam and thus custom-shape the patient’s radiation field. IMRT has shown promise in veterinary medicine, specifically for nasal tumors and urogenital tumors among others. Stereotactic Radiosurgery: Stereotactic radiosurgery (SRS) is a highly precise form of radiation therapy initially developed to treat small brain tumors and functional abnormalities of the brain. The principles of cranial SRS, namely high precision radiation where delivery is accurate to within one to two millimeters, are now being applied to the treatment of body tumors with a procedure known as stereotactic body radiotherapy (SBRT). Traditional linear accelerators may have the capability to administer SRS, or existing machines may be modified to allow this type of therapy to be delivered. Examples of linear accelerators that can be used for SRS are the TrueBeamTM or TrilogyTM by Varian, or the Versa HDTM by Elekta. Cyberknife TM is a form of SRS, which allows even greater precision and accuracy of dose delivery. Cyberknife TM technology allows radiation to be delivered with sub-millimeter accuracy to tumors. It utilizes a robotic arm to deliver the entire therapeutic dose to an animal in 1-3 treatments, compared to conventional radiation therapy, which can employ up to 20 treatments. 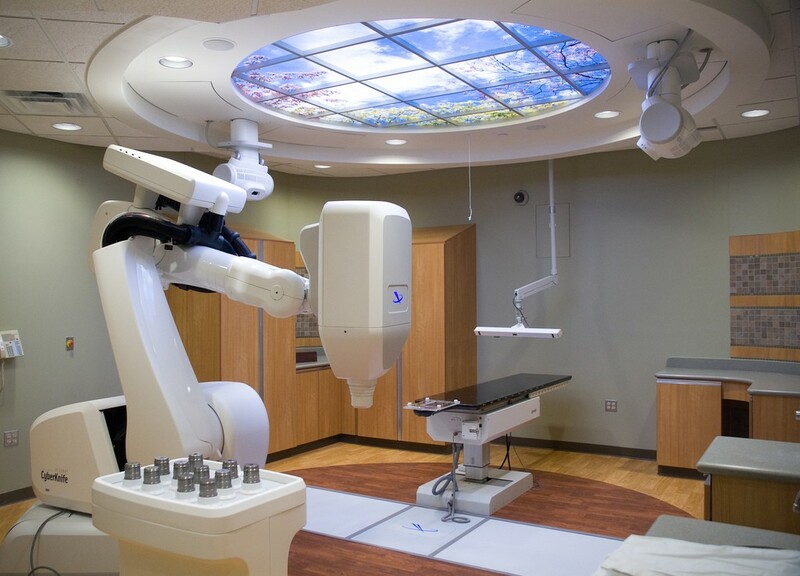 The robotic arm allows movement around the patient in order to target a tumor and spare normal surrounding tissue. This not only allows the treatment to be delivered in a short time, but also decreases side effects to an almost unrecognizable level. Cyberknife TM is best utilized for bulky tumors that can be imaged with either CT or MRI. Its use for incompletely excised tumors has not been determined. Despite its name, SRS is a non-surgical procedure that delivers precisely targeted radiation at much higher doses, in only a single or few treatments, as compared to traditional radiation therapy. This treatment is only possible due to the development of highly advanced radiation technologies that permit maximum dose delivery within the target while minimizing dose to the surrounding healthy tissue. The goal is to deliver doses that will destroy the tumor and achieve permanent local control.